Sit in a boozer in Sheffield or Leeds, strike up a conversation about football and drop in the name 'Zico'. The people listening won't think about the Brazilian legend, Arthur Antunes Coimbra, arguably the worlds best player in the late 1970s and early 1980s, they will know that you're talking about Mel Sterland. "I had an unbelievable time at Wednesday and at one point I couldn't see myself ever leaving but in March 1989 I signed for Glasgow Rangers. The main attraction was European football which the English clubs had been banned from." "I loved it up there but was soon on the move again in the summer of 1989. I had a chance to return to Hillsborough but Queens Park Rangers and Leeds United were also interested. In fact, I was on my way to Loftus Road when Howard Wilkinson called me. "I met Wilko and Bill Fotherby on the way home in a hotel and the way they sold Leeds United to me was incredible. They said they would win the league and get the club back into the big time and I wanted to be a part of that." "Soon after that we went down to Portsmouth for an evening fixture. I scored to put us 3-1 up and we were coasting. Vinnie Jones, Ian Baird and I were winding up the Portsmouth lads boasting about picking up a win bonus and that got to them, especially Martin Kuhl. "From that moment, Pompey were fired up and the night ended in disaster when I attempted a back pass to Mervyn Day which never got there and Guy Whittingham scored his second goal in a minute to bring them level." "Bramall Lane, Boxing Day. What a day, what a game! "We were the top two for most of the season and over 30,000 packed in there to see a cracker. They went 1-0 up and I managed to pull us level. "I'll never forget that goal. We were awarded a free-kick a long way out, I put the ball down and I told Gordon Strachan that I was going to hit it. He told me not to bother but I wanted it. "There was a bloke that used to go in my local and he'd been winding me up for weeks about the game so I bet him a fiver that I'd score. "I hit this free kick and I knew from the moment the ball left my foot that it was going in. The ball kept rising and it thundered into the top corner. I also knew where this bloke stood so I ran to the corner and could see him as I did a dance around the corner flag. What a moment that was, scoring for Leeds against Sheffield United at their place and I also took a fiver off a piggy!" "The games were coming thick and fast and we were enjoying it. We had a great set of lads and we were confident that we would get the job done." Leeds and Sheffield United had lead the way for months and after Leeds thrashed their promotion rivals 4-0 on Easter Monday at Elland Road, promotion and the title looked inevitable. "It went down to the wire and Newcastle had got themselves into the mix. Barnsley beat us at Elland Road and we knew we had to beat Leicester City in the final home game." "We won the league on goal difference, helped by the hiding we gave them at Easter. It was a great achievement. All the lads played their part and I will never forget the amount of champagne that got drank on the coach home from the south coast." "It was a fantastic experience but the best was yet to come. Wilko knew what he needed to improve the squad and he made three fantastic signings in Tony Dorigo, Steve Hodge and Rod Wallace. "We had a major blow at the start of the season when the opening game at Crystal Palace was postponed but when we eventually got underway, we hit the ground running with a victory over Nottingham Forest." "We were awarded a penalty and I was desperate to take it. I'd already scored one that afternoon and Gary McAllister wanted the spot kick. We were equally determined and proceeded to squabble like a couple of kids. I won the argument and thankfully stuck the ball in the net." "I played through the next three games with the help of injections but I had to come off at half time away at Tottenham Hotspur. I was in agony and wouldn't kick another ball for the rest of the season as the lads went on to win the league." 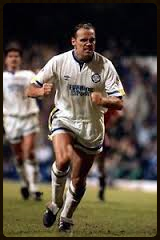 Despite four operations, Mel only played another five times for Leeds and his final appearance came on the 19th of January 1993 away at Charlton Athletic in a FA Cup third round replay. "I had some amazing times at Leeds United and I always receive a warm welcome when I go back there. "There some great characters at the club and it was a laugh a minute at times. I will never forget Vinnie Hilaire walking out for the summer team photo wearing painters overalls and carrying a pot of paint as he knew he wouldn't be getting much time on the field of play and thought he'd better earn his wages somehow! "I couldn't tell you my best memory at Elland Road as I loved every second of it. It was a pleasure to play for such a fantastic club and the fans were unbelievable. I soon realised that if you gave 100% they would love you and that's what I tried to do every week." Thank you to Mel Sterland for his time and giving me the opportunity to write this article.